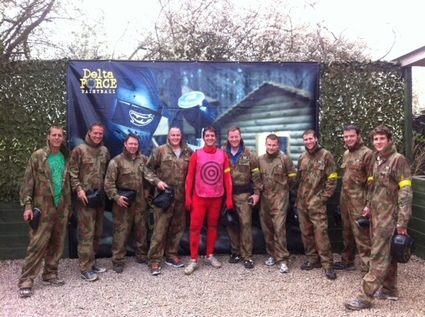 Delta Force Paintball Wales can be found just off Junction 34 of the M4 motorway in the gorgeous Cardiff countryside. The Cardiff paintball centre has six thrilling movie-like game scenarios for customers to enjoy and also offers special packages for birthday and stag and hen parties! The game zones at Delta Force Paintball Wales include the D-Day Landing scenario complete with landing craft and strategically places bunkers and The Haunted Graveyard where players are required take out the enemy and proceed through the graveyard, making use of the tombstones and coffins scattered around the area to hide behind. Adult players can also take advantage of the centre’s smoke grenades – perfect weapons for shocking and disorientating the opposition! The Cardiff paintball centre was also a recent winner of the prestigious UK Paintball Centre of Excellence Award. It received a complete refurbishment in 2012 and also had a new paintball gun introduced (the Tippman F-12) which features high pressure air (HPA), which is considered the next big thing in paintball! It’s no wonder then that over 20,000 people choose to visit the centre every year. Delta Force Paintball Wales also makes a great location for paintball birthday parties for adults and children over 8 years old, as well as stag and hen celebrations. Our expert staff are well organised and will ensure your day with us goes without a hitch; everything will be carefully planned with exciting game zones for you and your friends to enjoy. Where else can you explore the great outdoors, darting about in the woods and firing paintballs at your friends? Your day with Delta Force Paintball will leave you feeling exhilarated and talking about it for weeks later! helmets with anti-fog lenses, full body armour and combat suits with padded neck collars. Our paintball guns are maintained regularly to a high standard to ensure reliability and durability during your time on the battlefield. To request further information on Delta Force Paintball Wales or to book your special day of paintball for you and your group at the Cardiff paintball cenrtre, call 0203 869 9301 and speak to one of our friendly advisors.